This article is about the American actor. For the Australian wheelchair basketballer, see David Selby (basketball). David Lynn Selby (born February 5, 1941) is an American film, television and stage actor. 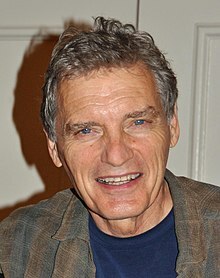 He is best known for playing Quentin Collins in the daytime soap opera Dark Shadows (1968–71), and Richard Channing in the prime-time soap opera Falcon Crest (1982–90). Selby also had prominent roles in the television series Flamingo Road (1981–82), and the feature film Raise the Titanic (1980). Also a published writer, Selby has written several books including novels, memoirs, and collections of poetry. Selby was born in Morgantown, West Virginia, the son of Sarah E. (née McIntyre) and Clyde Ira Selby, a carpenter. He attended West Virginia University in his hometown, earning Bachelor of Science and Master's degrees in theater, followed by a Ph.D. from Southern Illinois University. Midway through his career at WVU, Selby joined the cast of Honey in the Rock, a new civil war drama at Grandview State Park near Beckley, West Virginia, where he portrayed the Rev. Gordon Battelle, a Methodist minister who advocated for separation from Virginia. In 1968, Selby joined the cast of the TV series Dark Shadows as werewolf Quentin Collins. After the series' cancellation in 1971, Selby reprised the character in the second feature film based on the show, Night of Dark Shadows, released later the same year. (He would again reprise the role for a new series of Dark Shadows audio dramas from Big Finish Productions, beginning in 2006). In 1972, Selby co-starred with Barbra Streisand in the movie Up the Sandbox. He continued to appear in a number of films and television guest roles during the 1970s including U-Turn (1973), The Super Cops (1974) and Rich Kids (1979), and episodes of The Waltons (1974), Police Woman (1975) and Kojak (1976). He was also part of an all-star cast in the Emmy Award-winning miniseries Washington: Behind Closed Doors (1977). In 1979, Selby declined the role of Gary Ewing in the TV series Knots Landing, which went to Ted Shackelford. Selby was nominated for a Golden Raspberry Award for Worst Supporting Actor for his role in the 1980 film Raise the Titanic, which despite its established cast — including Jason Robards and Alec Guinness — was met with a negative reception from critics and audiences along with poor box-office takings. In 1981, Selby played the villainous Michael Tyrone in the final season of the NBC prime-time serial Flamingo Road. Immediately after its cancellation in 1982, he joined the cast of Falcon Crest as Richard Channing, the son of matriarch Angela Channing (played by Jane Wyman). Originally considered an antagonist of the series, Richard gradually became more of a protagonist and by the final season he was the central character of the show (in part due to the health-related absence of Wyman). Selby was nominated for six Soap Opera Digest Awards for his role of Richard (winning one). In all, Selby appeared in 209 episodes of the series, second only to co-star Lorenzo Lamas, who was the only actor to feature in all 227 episodes. Selby continued in numerous film and TV roles during the 1990s and 2000s including Dying Young (1991), White Squall (1996) and Surviving Christmas (2004), and episodes of series such as Cold Case (2007) and Mad Men (2009). To mark the 200th anniversary of Abraham Lincoln's birthday in 2009, Selby appeared onstage with Barack Obama and portrayed Lincoln in a scene from the play The Heavens are Hung in Black at the historic reopening of Ford's Theatre. (Selby had also played Abraham Lincoln in a 1998 episode of the series Touched by an Angel, titled "Beautiful Dreamer"). Selby made an appearance in the 2012 film adapation of Dark Shadows, one of four cast members from the original series to feature in the movie. The same year, he co-starred in Batman: The Dark Knight Returns, a two-part direct-to-video animated film adaptation of the 1986 graphic novel The Dark Knight Returns, portraying Commissioner James Gordon. In 2017, Selby had a recurring role in FX's Marvel Comics X-Men drama, Legion. Selby is also an accomplished writer. His work includes the plays Lincoln and James and Final Assault, as well as the poetry collections My Mother's Autumn and Happenstance. Novels he has written include Lincoln's Better Angel and The Blue Door. A Better Place combines memoir and social commentary to discuss Selby's West Virginia upbringing. In 2010, he published My Shadowed Past, chronicling what it was like to work on Dark Shadows. In 1998, West Virginia University awarded Selby its first "Life Achievement Award" from the College of Creative Arts. He received an honorary doctorate in 2004. 1974 The Waltons Joshua Williams TV series; "The Romance"
1975 Police Woman Nate Fesler TV series; "No Place to Hide"
1975 ABC's Wide World of Entertainment Jack 243 TV series; "The Norming of Jack 243"
1976 Kojak Sgt. Jimmy O'Connor TV series; "An Unfair Trade"
1978 Family Michael Kagan TV series; "More Than Friends"
1997 Promised Land Rowdy Sullivan TV series; "Cowboy Blues"
1998 Touched by an Angel Abraham Lincoln TV series; "Beautiful Dreamer"
2001 Ally McBeal Mr. Rohr TV series; "I Want Love"
2002 Thieves Donovan TV series; "The Green and the Black"
2007 Cold Case Dom Barron '07 TV series; "Boy Crazy"
2008 Raising the Bar Richard Patrick Woolsey III TV series; "Richie Richer"
2009 Mad Men Horace Cook, Sr. TV series; "The Arrangements"
2013 Rizzoli & Isles Senator Malcolm Humphrey TV series; "We Are Family"
2018 Castle Rock Josef Desjardins TV series; "The Box"
^ "David Selby Biography (1941-)". Filmreference.com. 1963-08-10. Retrieved 2014-06-04.